That’s a question most of us probably think we know the answer to, or can make a pretty good guess at. This past weekend we finally bought a composter for our garden. It’s the rotating kind that is attached to a frame and resembles a giant barrel that can be opened at either end. It holds about 6.5 cubic feet of material and can reach up to 144 degrees during the heat of the day. And it should produce good compost in just a matter of weeks depending on what kind of material you put it in. And that’s the reason for my post today. I wanted to share with other novice gardeners and environmentalists out there what makes good compost. First, why should you compost? Consider this: Composting helps the environment by reducing the amount of solid waste that would otherwise go in your trash and off to a landfill. Yard trimmings and kitchen scraps make up about 20% of your household waste. In the last 15 years, composting has reduced landfill wastes by 9 million tons. And using compost in your garden reduces your dependency on chemical fertilizers, which improves the environment overall. You save money, help prevent backyard pollution, which overall helps you reduce your carbon foot print. There are just 4 ingredients needed for composting: Nitrogen, Carbon, Water, and Air. The Nitrogren component can be achieved by adding green materials to your composter such as yard trimmings and leaves. The Carbon is added through brown materials like twigs and dry leaves. Your compost should be as moist as a wrung-out sponge, so don’t forget to add a bit of water. A lack of oxygen causes the compost to smell because it will kill off the organisms inside that are beneficial to the break down of the materials. This happens if the compost becomes too dense or too wet. That’s why our composter is handy because turning it every day helps with air flow. You actually don’t need a fancy store-bought composter to recycle. A contained trash can or bin will do. I would have even liked a more stable one with a compartment at the bottom that can be opened to access the compost while you can continue to feed it at the top, but those are usually much more expensive and take up more space. So our selection meets our needs and is easy to utilize. So, now to answer that question: What Can I Compost? Surprisingly, egg shells are neutral but can still be composted. All of these items should be used in moderate amounts and if you shred them first, they will break down quicker. Lawn waste can be shredded using a lawnmower first. For example, don’t stuff your composter with just pine needles alone. Or don’t put a cardboard box in there and expect it to breakdown . We started our first batch by filling our composter with dead leaves we collected from our flower beds, a touch of grass clippings and soil from weeding, coffee grounds, and some veggie scraps. Most of these bad items contain elements and chemicals that will attract bugs, ferment and cause odor, cause disease, or kill the healthy organisms you need in your compost. So there you have it! Now you know what to compost and what you need to get started! Do you already compost? If so, what gives you best results? 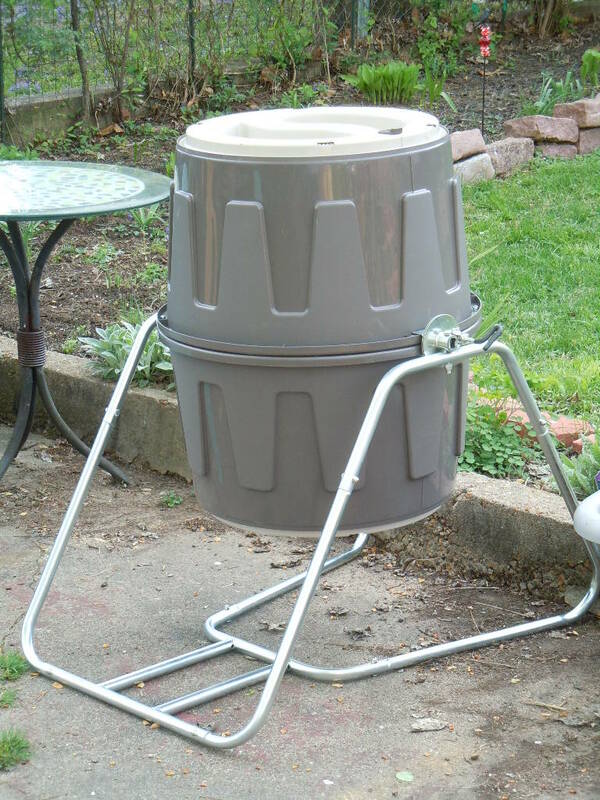 Do you utilize a store bought composter or did you make your own? How do you use your compost in your yard and garden?